I’ve been following the dovetail tool swap over at Lumberjocks, I really enjoy seeing that community in action. I’m tempted to participate in the swap, but holding off so I don’t overcommitted. Meanwhile I’ve had Brother Cadfael designing tools I could make for the swap, so go figure. One (of many) detours I’ve been down was to make a dovetail marking knife as laid out by David Barron. 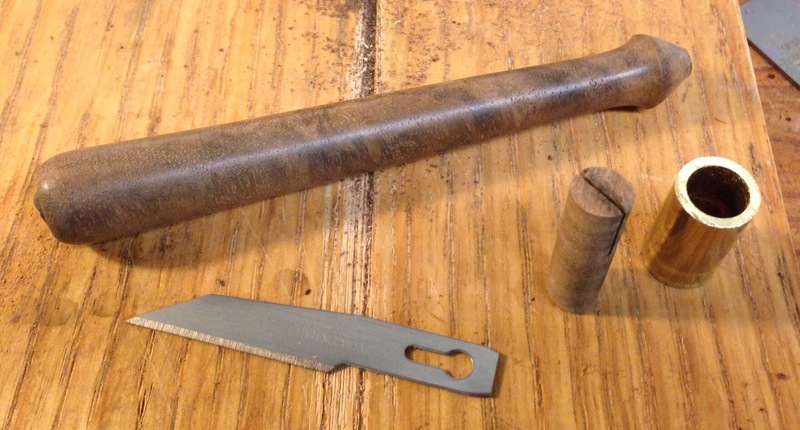 I love my Blue Spruce knives for general layout, and my Rob Cosman knife for dovetails — but this seemed like a quick and fun project. I’ve been gathering the materials over the past week, disposable scalpel blades from the UK, brass tubing and some pen turning blanks, so I decided to give it a shot after work yesterday. I’d never pretend to be a competent wood turner, mostly because no one would believe me. I’m having some issues with the spur center holding the stock firmly enough. The first blank I tried, in Cocobolo, was a fail. I hammered the spur drive in, started turning and had it spontaneously split. I must have driven the spur in too far, although it certainly didn’t seem like it. The Cocobolo was turning really nicely though. On the second blank, in Claro Walnut, I was careful not to drive the spur center too far. Just a light tap, ok? For the entire time I was turning, it was slipping. I tightened the tail stock to apply more pressure, and it would be ok for a moment, then it would slip again. It was a dance. But I got it turned. Ish. The neck where the brass ferrule goes was a little undersized. Just a little, maybe 10 thousands, but it was workable. The shape was a little fat and graceless, but ok for a prototype. The Walnut was really hard to turn too. In places it cut nicely, in others it was really prone to chattering. The next step is to saw a kerf for the blade. I went gently, but it snapped off. I’m not surprised, I could see it was weak and the Walnut was really brittle. I’m enjoying this process though. I like figuring out how to make things, and there are lots of little nuances to this. Figuring out how to use the lathe to turn a small part like this, how to turn section that is accurate to .002″ or so. I have another couple of pen turning blanks that I picked up, two feet of Brass tubing and a box of 50 UK scalpel blades so I’m confident I’ll get this figured out. Or, if not, I’m not out very much money or time. I hope you have a happy Thanksgiving day. I’ll be making shavings while the bird cooks on the smoker! Where do you get the brass tubing that you use for the ferrules? OnlineMetals.com. It’s 1/2″ OD x .065 wall seamless brass tubing. I bought a two foot length, and cut it with a pipe cutter — a bandsaw would be faster, but I don’t want to cut brass on my wood saw and I have the wrong blade in my other bandsaw. Thanks Joe! That online metals site looks very interesting, I’ll be saving that for later.